During the summer of 2019, cricket enthusiasts have some exciting matches to look forward to at the Kia Oval. CEC is pleased to offer cricket hospitality in modern shared facilities within the OCS Stand and Pavilion End. All of our facilities offer pitch views, an excellent vantage point to watch all the cricket action along with superb hospitality. For larger groups, our private boxes offer unrivalled views of the pitch all from the luxury of your own private balcony. Why not sample some of the finest cricket hospitality against a backdrop of some of the very best international cricket action. The Montpelier Club is the top cricket hospitality package available at the Kia Oval. The facility is located directly next to the player’s dressing room and offers spectacular views of the cricket action from the Pavilion Stand. Your reserved seats for the match offer elevated views of the ground, with seating behind the bowlers arm on the Montpelier Club balcony directly outside of the facility. Private tables are available subject to availability for groups of 2, 4, 6 or 8. The 2nd Floor Lounge is a glass-fronted dining restaurant that offers fantastic views of the Kia Oval pitch from the OCS Stand. The facility offers a classic hospitality experience with celebrity appearances from ex-international cricketers. Private tables are available for 10 or 12 guests, with smaller numbers accommodated at shared tables. Your match seats are situated directly outside the facility, allowing easy access to and from your facility. The Corinthian Roof Terrace was specifically developed for the Ashes 2015 and is a superb new and modern area to enjoy a relaxed and informal cricket hospitality experience. It is situated on level 4 of the OCS Stand and offers incredible views of the major landmarks of London along with a fantastic view for the cricket. This facility offers an informal seating area with poseur tables and an exclusive private terrace accommodating a maximum of 84 guests. Our Executive boxes at the Kia Oval offer a superb base for private groups from 8 - 24. The boxes are situated around the circumference of the pitch and offer stunning views of the day’s play from your own private balcony and seating area. If you wish to entertain guests, colleagues or friends privately, our boxes offer you the very best in cricket hospitality. The John Major suite is located at the end of the second floor of the OCS Stand. 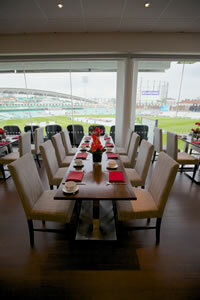 The suite has a private terrace with premium outdoor seating overlooking the famous Oval wicket and the Pavilion Stand. Hospitality includes a three-course buffet lunch and complimentary bar. Private tables are available for groups of 10 or 12, with smaller numbers accommodated on shared tables.